Cuivre River Electric Cooperative (CREC) seeks interested and qualified candidates for four, three-year term seats on its Board of Directors. Candidate nominations open on Monday, April 1 and close on Wednesday, May 15. Qualified candidates will be asked to attend a Nominating Committee reception and interview on Tuesday, May 21 at 6 p.m. at the CREC branch office, 8757 Hwy. N., Lake Saint Louis, MO. Each candidate must reside in the district they would represent and be a member of the cooperative for the six consecutive months immediately preceding the election. Full director qualifications as specified in Article IV Section 3 of the cooperative bylaws are available on the CREC website (https://www.cuivre.com/content/bylaws). 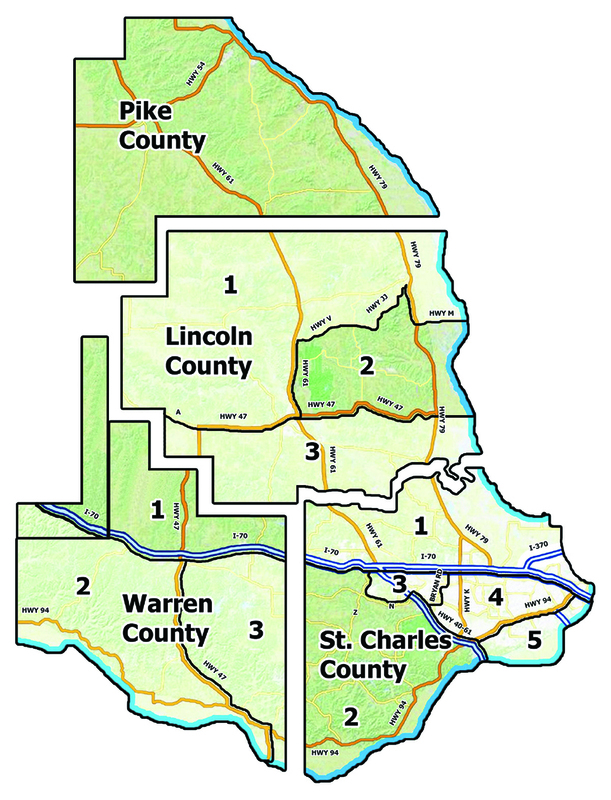 Four directors will be elected, one from each of these districts: Warren County District 1; St Charles County District 2; Lincoln County District 2; and Pike County. Absentee voting via a secure internet site or by paper ballot begins on July 9 and closes on August 19, or members may vote in person at the annual meeting on August 22 at the cooperative’s Lake Saint Louis branch office. More information about the voting process and the annual meeting will be forthcoming in Rural Missouri/Current Times and the co-op’s e-newsletter, CREC Connections, as well as the CREC website. Elections are held for four of 12 district seats each year on the CREC Board of Directors. The above shaded areas show districts seeking candidates for 2019. To confirm the district you live in, call 636-695-4871.